There’s a painting in my museum that many visitors hate. It’s a black, shiny rectangular slab by John McCracken. McCracken was a minimalist artist famous for monolithic planks covered in monochromatic auto paint. The slabs are usually exhibited leaning up against the wall. If you were making a movie with a scene that mocks minimalist art, you’d put fake John McCracken pieces on the set. Tell a compelling, entertaining story. McCracken believed in UFOs and aliens. He believed that he was constructing artworks that could have been created by alien life forms. Over time, his delusion deepened, and he came to believe he was creating alien portals to earth, on assignment by the aliens. Ask them what they make of it. After the requisite snarky comments (“a waste of paint”), most people note their own reflection in the shiny surface. As visitors look at themselves (always a relevant and compelling experience), I tell them that McCracken was fascinated by car culture in Los Angeles—all those shiny “moving paint chips” blazing under the Southern California sun. He noticed how people would look at themselves in the shiny reflections of car exteriors, fixing their hair, pursing their lips, reinventing themselves in car windows and doors. He used automobile paint to make his bright slabs, which are like giant flat screen mirrors held up to our own narcissism. Forty years before iPhones, he imagined a future world where we are obsessed with staring into shiny black rectangles. Both of these approaches would probably make you more interested in the work. Both stories impart a sense that artists are imaginative, that conceptual art can stem from wild ideas and connections about how the world works. But the first story tells you about an artist who was obsessed with aliens. The big takeaway is: that guy was nuts. The second story tells you about an artist who thought about how we relate to our own image and to screen-like devices. The big takeaway is: how do I relate to my own image? The second approach is more relevant. It is more connected to people’s daily lives, and it might be more likely to kindle a newfound interest in exploring the big questions in conceptual artworks. Then again, given the choice, I often go with the aliens. It’s too good a story to pass up. And that’s a problem. Many of us, especially those of us bubbling over with fascinating knowledge to share, prattle on about whatever we consider compelling without first questioning whether our audience cares a whit about it. We assume: the person is in the museum, ergo they want the juicy tidbits. This works as long as what we have to share is so novel that it is genuinely arresting. But this approach is ultimately limited. Let’s say you have something incredible to share. Something at the level of the aliens. Is it titillating but irrelevant? Or does it actually help someone get closer to the work? When we share shocking stories—Van Gogh’s sliced ear, an affair between the ballerinas, a celebrity who recently did a photo shoot at the park—we can stimulate a strong emotional response. But we’re opening a shallow door to a small section of the room. It’s not clear how that initial titillation will entice someone into deeper exploration of the content and experience on offer. Compelling information may incite a response. But that response fades quickly. It rarely yields the kind of positive cognitive effect that people can use to bring meaning to other parts of their lives. And in reality, most of the information professionals share is neither shocking nor incredible. Most insider information is interesting at best. It doesn’t make you care. It doesn’t entice you to open the door. So why should you? The urge to entertain can be a serious distraction from relevance—the kind of irrelevance that makes your work harder to access, not easier. 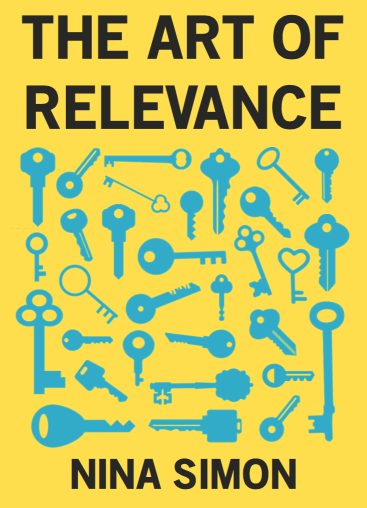 Relevance doesn’t trump compelling – it does something different. The function of relevance is to create a connection between a person and a thing, in a way that might unlock meaning for that person. If you can tell a relevant story first, you are more likely to create an appetite for the other compelling information you have to share. You will unlock a deeper door. You will make meaning instead of putting on a show.